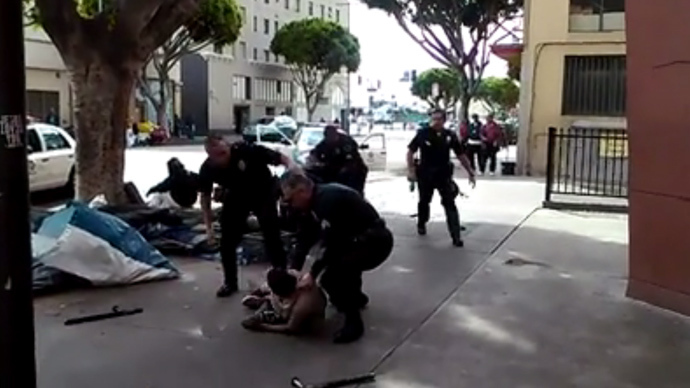 Video footage of Los Angeles police officers shooting dead a homeless black man, aka Africa, has triggered an avalanche of protest on social media. The man had allegedly been just recently released after spending 10 years in a psychiatric facility. Footage of the incident, published on Facebook by one of the witnesses, shows a group of LAPD officers scuffling with two people. After two officers dragged one person away, others wrestled the second person to the ground.One of the officers is heard saying “Drop the gun!” About five shots can then be heard. Police have not identified the man, who was declared dead at a hospital shortly after the shooting which occurred around noon, The Los Angeles Times reported citing police spokesman Sgt. Barry Montgomery. No officers were injured in the incident, Montgomery said, adding that police were responding to a robbery call on the 500 block of San Pedro Street. LAPD: No guns recovered at scene of street execution. Three officers fired on the restrained man. The shooting occurred in downtown Los Angeles' Skid Row, near the Union Rescue Mission which provides a number of services to homeless people,BuzzFeedreports.